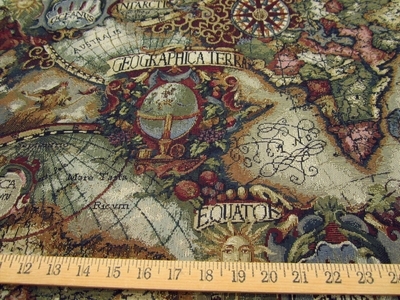 This fabric is on backorder will update soon Magellan Old World Map tapestry upholstery fabric, color Jewel. 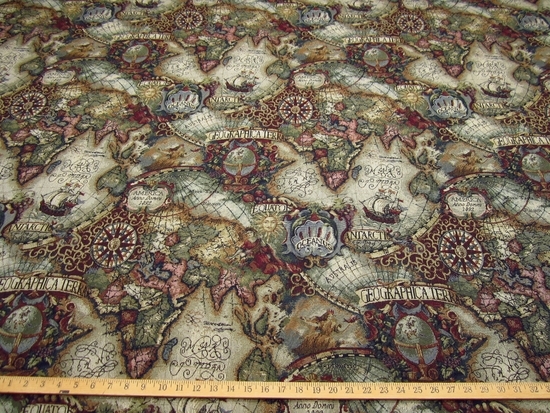 This is a Mastercraft American Classic fabric from Regal Fabrics, it's also known as Magellan's Quest tapestry. Color of this one is "Jewel" and has colors of parchment gray background with shades of navy blue, shades of green (artichoke, olive), shades of gold, shades of wine, rose, plum, tan and a little black. This fabric is 60" wide, contents are 52% cotton - 48% polyester. Repeat is H:30" x V:25.5" and is a railroaded pattern meaning the pattern is laid out across the bolt for easier upholstery use. The width is 60" and your order will be in a continuous piece, the price is per yard.